Act 3 of François-Frédéric Guy's Beethoven Project. 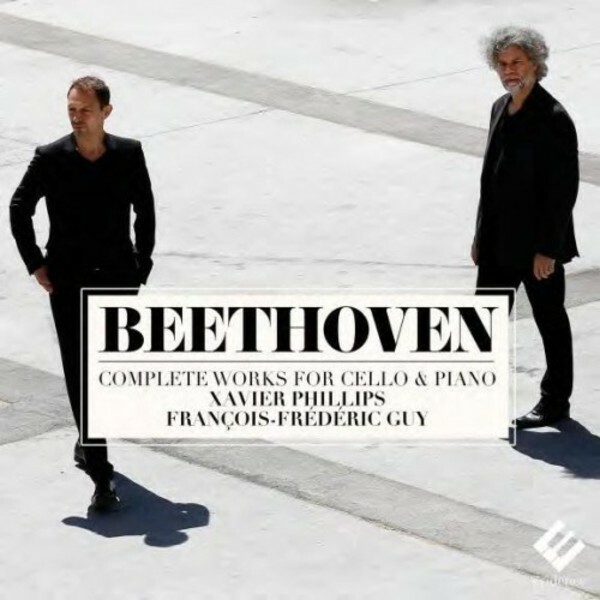 On the programme: Beethoven's complete music for cello and piano with cellist Xavier Phillips, recorded by Nicolas Bartholomée at the Arsenal in Metz in January 2015. Born in Paris, Xavier Phillips started playing the cello at the age of 6. His encounter with Mstislav Rostropovitch proved especially fruitful since it marked the beginning of a long collaboration during which Xavier Phillips received the guidance and encouragement of the master cellist. His eclectic and varied discography has been warmly welcomed by the critics. His last recording – dedicated to Dutilleux 'Tout un monde lointain' – received tremendous reviews and was nominated three times for the Grammy Awards 2015.